The matter changed in 1992 when John Clive Ball published the first edition of the present book. This book was a game changer. Rather than reacting to what others had claimed, it set a new standard of historical forensics by which all future publications about the Holocaust had to be tested. Almost every revisionist book that appeared after Ball’s epoch-making study also included analysis of relevant air photos. The most important book in this regard is probably Mattogno’s Auschwitz: Open-Air Incinerations. It investigates the claims made by many Auschwitz witnesses that, from May through August 1944, gargantuan cremation pyres in huge pits were burning day and night at the Auschwitz-Birkenau Camp, upon which the corpses of hundreds of thousands of murdered Hungarian Jews were being turned into ashes. It is claimed that during this time the entire area was blanketed in thick smoke. Of course pictorial evidence of such large undertakings would have been captured on air photos taken by Allied reconnaissance planes. But as the reader of the present study will discover, the extensive photos of the place and time show nothing unusual at all. It goes without saying that some of the few orthodox historians who dared to confront revisionist research had to deal with these air photos as well (foremost Shermer/Grobman and Zimmerman), although their attempts at papering over the huge cracks in orthodox historiography were swiftly exposed as seriously flawed by leading revisionists. It is needless to say that there can be only one original negative of each photograph, namely the one that was in the camera when the photo was taken (and which the CIA might have destroyed). All the other negatives are copies, of which in this case many may exist at various locations, each of them of course subject to loss of quality and alteration. An interesting episode about the question whether or not these air photos have been tampered with occurred in the context of the second Zündel trial. During that time, Dino Brugioni approached Ernst Zündel privately and told him “off the record” that he himself does not believe that the air photos published by him prove the orthodox Holocaust narrative and that he, too, has the suspicion that the photos he was given by his superiors to analyze in 1979 had been tampered with. For me, of course, this is not much more than hearsay, so not much weight can be put onto it. Fact is, however, that in 1999 Brugioni published a book entitled Photo Fakery which explored “The History and Techniques of Photographic Deception and Manipulation,” according to the subtitle of the book. The book exposes and explains a wide variety of tampered-with photos of political importance. Only one set of photos in the entire book is claimed to be original, untampered and authentic: the Auschwitz air photos Brugioni had published 20 years earlier. Why would Brugioni include those exceptions in a book about forgeries which otherwise doesn’t even remotely touch upon the Holocaust topic? I leave that to the reader’s imagination. John Ball and I started working on a new edition of his book in late 2003/early 2004, when he started sending me new aerial photos not discussed in the first edition of the present study. At that time we also considered enabling the reader to look at some of the Auschwitz air photos taken in rapid succession with 3D glasses in order to get a three-dimensional impression. The project was delayed, as I was working on other projects, and then, in October 2005, I was actually arrested by the U.S. authorities and deported back to Germany, allegedly for an immigration violation, but really because my revisionist work had made me many powerful enemies (see Rudolf, Resistance Is Obligatory). At that time three other leading revisionists were also thrown in jail (Ernst Zündel, Siegfried Verbeke, David Irving). Although that is an entirely different story, fact is that John Ball got scared by this sudden spike in persecution of peaceful dissidents. Around that time, he decided to quit revisionism, hand over all material to others who wanted to continue, move to a different place, start a different business, and change his name. Only in early 2015, after I had published the greatly improved 3rd edition of the present book, did John Ball contact me. Since most of the material in this book is in the public domain for which John could not claim any copyright, and because he still did not want to get re-involved in, or associated with, revisionism, he asked me to remove his name from this new edition and use someone else’s. He also told me that he could not help me with getting the original photo prints used to prepare his first edition, because in 1994 he had given them all to Ernst Zündel on his request, but when Zündel’s home in Toronto was fire-bombed a year later, all the prints went up in flames. Therefore, for this edition, too, we will have to make do with the professionally prepared high-resolution scans of the images reproduced in the first edition. Quality losses are minimal, and the results visible in the present print-on-demand book are good enough for most of us. Those who want to seriously explore this issue in more depth are advised to get prints from the archival resources mentioned, though. The present study has 168 pages, 48 more than the first edition. This is due not only to the fact that I have included a few more air photos addressing issues not discussed in earlier editions of this work – as mentioned before – but also because all the pertinent material which John Ball had published in his 1993 16-page brochure The Ball Report has been integrated. That brochure consisted mainly of Ball’s schematic drawings of the crime scenes investigated plus a brief summary of chemical analyses of wall samples he had taken at Auschwitz in early 1993. I have expanded that subject with a brief introduction into the relevance of analyzing such samples, and by summarizing the analytic results obtained by other authors who preceded Ball with their sampling. Several sections of Ball’s original work have been extensively edited for this current edition, as they were erroneous to the point where keeping them as they were would have been irresponsible. Writing this, I do not mean to criticize Ball for the mistakes he made back then. In the early 1990s, John Ball was a novice in Holocaust research (as was I at the time). It was therefore to some degree inevitable for him to make a number of mistakes. Some of them he might have avoided, had he communicated with more-experienced researchers in the field prior to publishing the first edition of his book. Other errors, however, became apparent only due to subsequent research published in later years, upon which I could rely for this edition. One of these issues – whether the black lines around the Birkenau crematoria are due to thick fences or the result of CIA manipulations – is addressed in this edition by Carlo Mattogno. He shows that the Auschwitz camp authorities planned to surround the crematoria with vegetation making them less conspicuous to the inmates, and a post-war photo indicates that at war’s end a makeshift fence of tree branches was indeed present around at least one of the crematoria, or rather its ruins. I doubt, though, that such a slender fence of twigs and branches could produce the thick dark lines on the air photos, which look more like massive, thick walls. For this reason, I keep Ball’s original suspicion of manipulations as it is. There have been two noteworthy reactions by experts to Ball’s findings, one by Nevin Bryant, supervisor of Cartographic Applications and Image Processing Applications at NASA’s Jet Propulsion Laboratory in Pasadena, California, the other by Carroll Lucas, an expert of air-photo interpretation with 45 years of experience working for the biggest criminal organization in the world, the CIA. We know of Bryant’s expert opinion only through what other wrote about it, which was pretty much limited to identifying several groups of inmates visible on the photos. Of course, in a camp housing many thousands of inmates, and during late spring and early summer 1944 at times perhaps even more than a hundred thousand, you would expect to see many groups of inmates moving about outdoors. That proves nothing. In that context, Shermer and Grobman committed a minor blunder about the so-called “moiré effect” which I address here on p. 63. (I am sure that Bryant would not have endorsed such nonsense.) 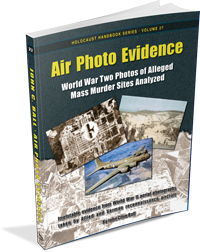 Interestingly, Shermer and Grobman – and with them probably also Bryant – are completely silent about any outdoor cremations, even though that ought to be the primary focus of any air-photo analysis, as such cremations would be highly visible and would allow gauging the order of magnitude of the claimed events unfolding at Birkenau in 1944. Lucas’s 23-page report was published in its entirety (Zimmerman, pp. 276-298), but surprisingly he does not reproduce any air photo, and thus offers nothing at all to back up his claims and conclusions. Regarding outdoor cremations, he correctly points out that small smoke plumes are visible on some photos (Zimmerman, p. 290; see several such photos on pp. 97-101 in this study), but he neglects to compare those small fires with the kind of pyres that would have been needed if the claimed daily outdoor cremation of thousands of gassing victims had really happened. As Mattogno has shown, Lucas was apparently harassed by Zimmerman to make statements which are not supported by the evidence, like the claim that storage barracks are visible near the so-called Bunker 2 on a photograph of May 31, 1944, when later images clearly show that these storage barracks were built only subsequently (Zimmerman, p. 299; see p. 119 in this study). That leads me to believe that Lucas’s analysis was not an expert report but rather a report of complaisance. At any rate, he, too, failed to find evidence for mass murder. With this, please enjoy reading this fine pioneer work of Holocaust revisionism in its latest, revised edition. At this point, I wish to express my gratitude to Jett Rucker for carefully proofing this study, to John Ball for sending me scans of his original hand-drawn maps and schematic drawings, to Hannes Metzner for his constructive criticism, and last but not least to Carlo Mattogno for his critical and constructive peer review, in particular for his input regarding potential mass graves near the Auschwitz-Birkenau Camp as discussed in Section 5.13, as well as for writing his short essay on the crematoria fences added to this study on pp. 70-74. In the 4th U.S. edition of 2015, see the chapter “Auschwitz of Great Interest to Americans,” pp. 85-89, and “Where are the pictures?”, pp. 202f. See Carlo Mattogno, “Denying Evidence,” in: Rudolf/Mattogno, pp. 203-280, in particular pp. 236-245; and “The Elusive Holes of Death,” ibid., pp. 291-407; especially pp. 303-305, 380-384. John C. Ball, “Luftbildbeweise,” in: Gauss, pp. 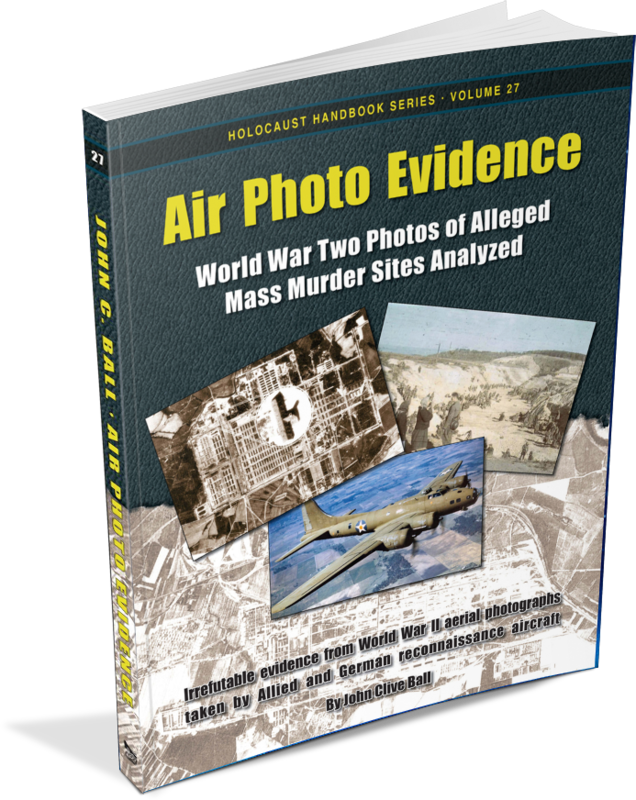 235-248; English: “Air Photo Evidence,” in: Rudolf, Dissecting the Holocaust, pp. 269-282. Here quoted from the English ed., ibid., pp. 278f. Bailer-Galanda/Benz/Neugebauer, p. 25 (translation mine). On that trial see Kulaszka. See the review by Widmann. Shermer/Grobman, pp. 143-153; similar van Pelt, p. 84. Auschwitz: Open-Air Incineration, 2nd ed., pp. 52f., 54-57, 65-79. Format: pb, 8.5″×11″, 262 illustrations, bibliography, index. If you decide to download this book’s free PDF or Kindle file instead of purchasing it, please consider supporting the publishers with a donation for their generosity. Electronic files of some (but not all) of the volumes of the Holocaust Handbooks have been released to the public domain for educational purposes only. Where this is the case, the files can be downloaded above. They may be copied and distributed by third parties free of charge only. No commercial use by third parties is permitted. If copied and distributed, no changes to the book are permitted without the prior written consent of the book’s author(s)/editor(s).